Recent intuitive robot programming approaches operate on task level, enabling programmers to intuitively arrange or compose encapsulating robot capabilities (skills). This paper presents an approach to intuitively create (sub-)skills. 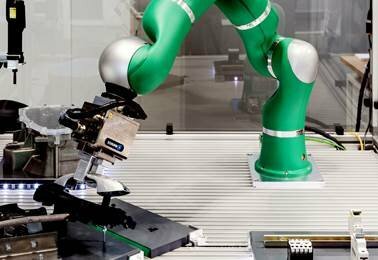 General guidelines for assembly process descriptions #2860 provided by the Association of German Engineers VDI are applied to robot programming, in particular addressing assembly applications. The guidelines are exemplary applied to the constraint-based approach iTaSC (instantaneous Task Specification using Constraints), presenting a procedure to hierarchically combine elementary processes to (sub-)skills. Six elementary processes are identified to be sufficient to implement a wide variety of assembly tasks. An iTaSC implementation was developed and two exemplary assembly tasks were realized to evaluate the approach.